Any student attending a school that participates in the National School Lunch Program or School Breakfast Program can receive a meal. Children from low-income families are eligible for free or reduced-price school meals. 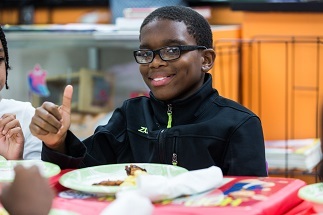 Participating schools receive federal funds for each breakfast and lunch served. See school breakfast and lunch reimbursement rates for this school year. 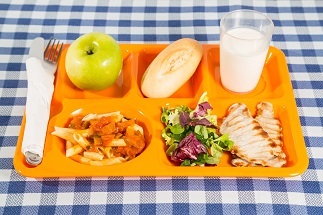 Who is Eligible for Free and Reduced-Price School Meals? Children in households with incomes at or below 130 percent of the federal poverty level are eligible for free school meals. Children in households with incomes between 130 to 185 percent of the federal poverty level are eligible for reduced-price school meals and can be charged no more than 30 cents for breakfast and 40 cents for lunch. Children in households participating in the Supplemental Nutrition Assistance Program, Temporary Assistance for Needy Families, and the Food Distribution Program on Indian Reservations as well as foster youth, migrant, homeless, or runaway youth, and Head Start participants are “categorically eligible” for free school meals. Children from families with incomes above 185 percent of the federal poverty level may purchase a “paid meal.” Prices for paid meals are set by each school district. Children can be certified for free and reduced-price school meals based on household income via a school meal application or can be certified without an application based on participation in other means-tested government programs. Children in households participating in the Supplemental Nutrition Assistance Program (SNAP), Temporary Assistance for Needy Families (TANF), and the Food Distribution Program on Indian Reservations (FDPIR) as well as foster youth, migrant, homeless, or runaway youth, and Head Start participants are “categorically eligible” (automatically eligible) for free school meals and can be certified without submitting a school meal application. Schools can utilize data from the state to certify categorically eligible students or can coordinate with the school districts homeless and migrant education liaisons to obtain documentation to certify children for free school meals. signature of an adult household member — the adult’s Social Security number is NOT required. Requests on the application for ANY other information are strictly optional. 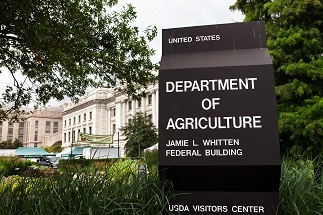 Schools are required to directly certify children in households participating in the Supplemental Nutrition Assistance Program (SNAP) for free school meals through a data matching process. School enrollment records are matched with SNAP enrollment records either at the state level or school district level to automatically enroll students for free school meals without the need for an application or additional paperwork. States and schools may also utilize data on households participating in Temporary Assistance for Needy Families and Food Distribution Program on Indian Reservations, or students who are in foster care, migrant, or homeless to directly certify other categorically eligible children. Nineteen states utilize Medicaid household income data to directly certify eligible children. Find out more. If a child is not categorically eligible, the child may qualify for free or reduced-price meals based on household income. These households must fill out a school meal application. In the past, school districts collected paper applications from families, however, many districts have moved to offering online applications. the last 4 digits of the Social Security number of the adult household member who signs the application, OR if the adult does not have a Social Security number, s/he must write “NONE” in that space or check the box, “I do not have a Social Security number,” if provided. It cannot be left blank. The child’s school then compares the household size and total income to the Federal Income Eligibility Guidelines, which determine who is eligible for free and reduced-price meals. 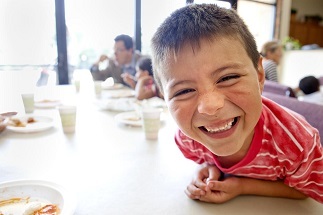 Children from families with incomes at or below 130 percent of the poverty level are eligible for free meals. Those with incomes between 130 percent and 185 percent of the poverty level are eligible for reduced-price meals. In the 2016–2017 school year, a household of three earning $26,208 or less would qualify for free school meals and a family of three earning up to $37,296 would qualify for reduced-price school meals. For more information, see FRAC’s Reimbursement Rates and Income Guidelines for the Federal Child Nutrition Programs.